If you’re looking for year round festivals, diverse culture, eco adventure activities, and unique dining experiences, Trinidad & Tobago is the latest hot spot–especially for millennials. 1. Designed to be used offline, avoiding roaming charges and need for Wi-F.
2. Fully zoomable map, containing points of interest and interactive guide which provides distances and routing information from current location. 3. Local hotel and restaurant pricing, ratings and contact information. 4. Information on attractions, landmarks, beaches and things to do nearby with direction. 5. User-friendly photo gallery with zoomable pictures. The Trinidad & Tobago Travel App is available via Apple and Google stores and comes preloaded on all Samsung Smart TVs and can be downloaded onto smart devices. Eco-adventure —According to TravelAge West, millennials tend to be more adventurous travelers, looking to venture out and explore. Tobago, known for its unspoiled beaches and great weather, offers the quintessential Caribbean vacation plus so much more. Travelers can hike the oldest protected reserve in the Western Hemisphere, The Main Ridge Rainforest, to seek out hidden waterfalls amongst local flora and fauna. Tobago has a large population of hawksbills living in its numerous coral reefs and many green turtles inhabit the sea grass beds off the coast. With 80% of all leatherback nesting in the insular Caribbean, both islands offer a near guarantee to witness giant sea turtles on beaches from March through September. Adventure seekers can go zip lining to get a bird’s eye view of Trinidad while soaring 100 feet in the air across seven different zip lines through Macqueripe Bay. For information these tours and more, contact Trinidad & Tobago Incoming Tour Operators Association. Watersports — Tobago is home to the largest brain coral in the world. Fascinating coral formations, countless fish and exceptional water conditions, makes Tobago an ideal for exploring underwater. Divers can catch a glimpse of barracudas, dolphins, whale sharks, turtles, porpoises, butterfly fish, queen and French angels and parrotfish. Paddleboard novices can head to idyllic Pigeon Point Heritage Park in Tobago and visit Stand Up Paddle Tobago for personalized instruction on all the basic skills, including board balance and paddle technique. Surfers can “hang tenâ€ with Trinidad and Tobago Surf Experience, located on both islands, for top-notch surf experiences. Those who prefer wind or kitesurfing can visit Radical Water Sports, Tobago’s professional windsurf center, also located at Pigeon Point. Those more interested in soaking up the sun, rum punch in hand, can hop on a glass bottom boat at Pigeon Point for a tour through Buccoo Reef, where the views are breathtaking — both underwater and out of water. 2. Roti – meat or vegetables in curry sauce, wrapped in pita-like pastry. 4. Curry crab and dumplings – the staple dish for visitors in Tobago and can be found at many restaurants around the island. Trinidad & Tobago is also the birthplace of the steel pan (the only instrument invented in the 20thCentury), soca and calypso music. Steel pan bands can be seen practicing at various locations throughout the island year round. Festivals — Although best known for its Carnival celebration, the cultural diversity of the nation is reason for year-round festivals. Tobago Heritage Festival celebrates traditions that are mostly African, with the main event, the traditional “Ole Time Wedding,â€ taking place in the village of Moriah. 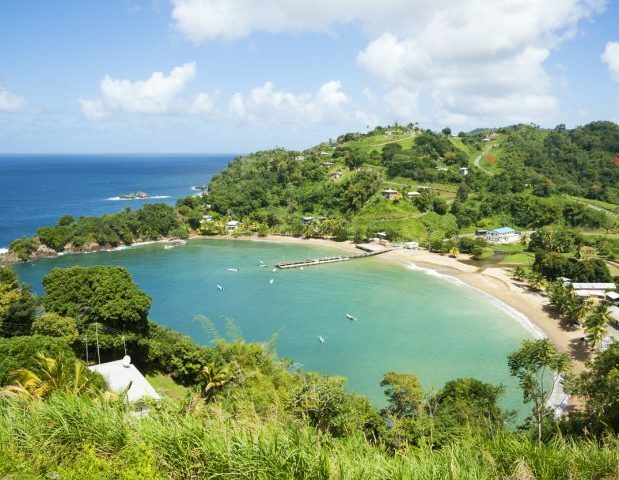 Beginning this July 17 with fetes culminating in a J’ouvert and street parade on Emancipation Day (August 1), Tobago Heritage Festival is one of the most important celebrations of the year for Tobago. Tobago also hosts one of the most unique food expositions in the Caribbean, the Blue Food Festival. It is an annual festival where local chefs and creative, indigenous cooks come together to share their knowledge, cooking secrets and tasty blue creations with commonly-used local ingredient dasheen, the Caribbean root vegetable that actually turns blue when cooked. Chefs compete against one another to create the best appetizers, entrees, desserts and even wine with this unique ingredient every October.